The Stenhouse Family, Maxwelton House, Moniaive, Dumfriess-shire, bought circa 1970. In its bombe form and lustrous mahogany veneers this cylinder bureau relates to a padouk and fustic kneehole desk, sold in these Rooms, 19 November 1992, lot 54. In the introduction to the Wentworth sale (Christie's London, 8 July 1998) that kneehole desk was speculatively connected to the Wakefield firm of Wright and Elwick. 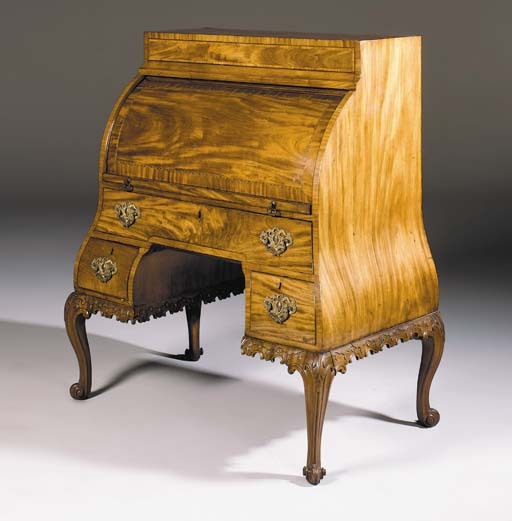 The kneehole bureau had a number of features that were identified as being characteristic of Wright and Elwick: close derivation from a pattern in Thomas Chippendale's Gentleman and Cabinet-Maker's Director, exotic timber and heavy decoration.